A quick look at the chart for Atwood Oceanics shows a familiar pattern for those who have been following the price action of companies in the offshore contract drilling industry. Shares of Atwood have declined by approximately 30 percent from the trading levels that prevailed in the weeks prior to the April 20, 2010 Deepwater Horizon disaster. However, Mr. Market is generally incapable of evaluating the details behind specific situations and appears to have unfairly discounted Atwood based on one surprising fact: Less than two percent of the company’s revenues in the current fiscal year were derived from activities in the Gulf of Mexico. As we have seen in our previous articles on Noble Corporation, Ensco, and Diamond Offshore, opportunities exist for investors who are willing to look past the emotional distress of Mr. Market and come to their own conclusions on valuation. However, all three of the companies previously analyzed had at least some material activity in the Gulf of Mexico and one could plausibly argue that some impairment could exist going forward due to more onerous regulations. The same cannot be said about Atwood due to the immateriality of the Gulf of Mexico to overall revenues and the fact that the one rig that Atwood operates in the Gulf is only rated for shallow water activity. 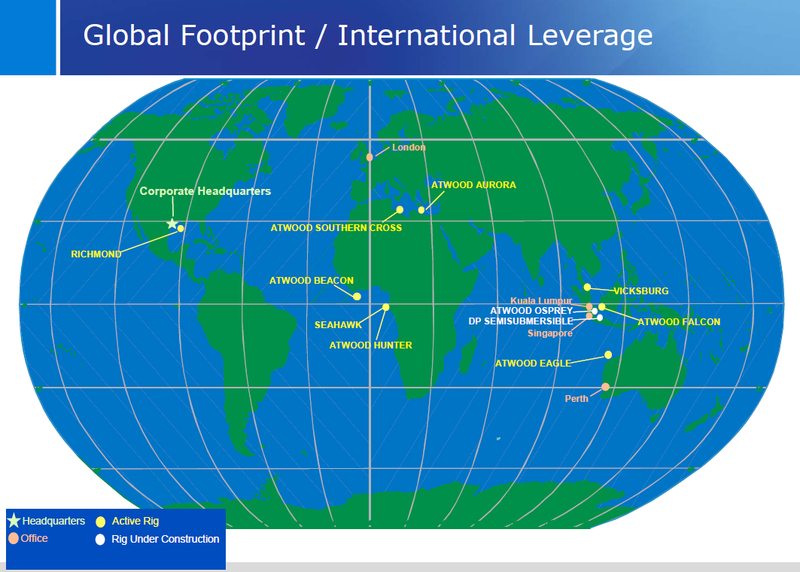 Atwood Oceanics is a relatively small player in the offshore contract drilling industry. The company currently has a market capitalization of approximately $1.67 billion with tangible book value of $1.3 billion as of June 30, 2010. The company operates nine drilling rigs comprised of five semisubmersible units designed for deeper waters along with three jack-up rigs and one submersible rig designed for shallow water drilling. In addition, the company has two ultra deepwater semisubmersible rigs under construction and has been heavily investing in expanding capabilities for deepwater exploration. Those who are unfamiliar with the characteristics of different rig types are referred to our profile of Noble Corporation in which we explain the capabilities of each class of rig. The exhibit below provides selected data from Value Line’s latest report on Atwood Oceanics. Note that Value Line covers Atwood in their “expanded edition”. As we can see, Atwood’s financial results mirror the strong performance of other contract drillers over the past five years as the industry has benefited from relatively high dayrates that resulted from increased exploration activity due to robust oil prices. Throughout this period, Atwood has been able to grow margins and has posted yearly advances in revenues and earnings per share. While the company has generated significant cash flow in recent years, an aggressive capital expenditure program has exceeded operating cash flow over the past two fiscal years. The company has taken on debt in order to fund the capital expenditure program and there have been no dividends or share repurchases. The following exhibit shows selected data related to the company’s cash flows, capital expenditures, and rig utilization for the past five fiscal years. While debt levels have increased and now stand at $230 million as of June 30, leverage is still modest at 15 percent of capital. Furthermore, interest service on the debt is currently modest due to the fact that the terms of both of the firm’s lines of credit are floating rate and currently have an average interest rate of under 2 percent. The company has spent $136.9 million on capital expenditures in the first nine months of fiscal 2010 and expects that total capital expenditures for the year ending September 30, 2010 will be $250 million. Debt is forecast to increase to between $250 million and $275 million by September 30. These capital expenditures are mostly associated with the company’s two newbuild ultra deepwater semisubmersible rigs. As we noted previously, only one of the rigs is currently located in the United States Gulf of Mexico and that rig is a submersible unit designed for operations in very shallow waters of up to 70 feet. The Richmond rig is currently under contract with Rooster Petroleum through the month of September 2010 at a dayrate of $36,000. 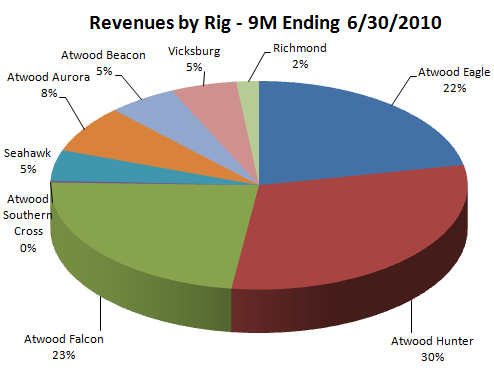 Revenues for the Richmond rig were $8.6 million, or 1.8 percent of total revenues, for the first nine months of fiscal 2010 due to downtime and required inspection activities. Revenues for Richmond were $19.1 million, or 3.3 percent of total company revenues, for fiscal 2009. We can see that the majority of company revenues and profitability is attributable to the semisubmersible rigs capable of operating in deep waters. 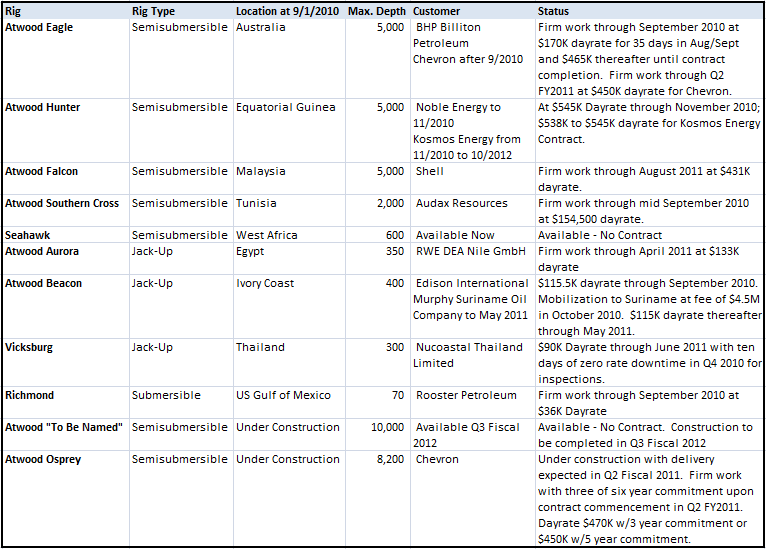 The semisubmersibles capable of drilling in deeper waters appear to be the most profitable. The company reported that the Atwood Southern Cross has had difficulty finding contracts and this can most likely be attributed to the rig’s relatively limited maximum water depth of 2,000 feet. The company reports that there have been “virtually no drilling programs awarded over the last year for semisubmersible drilling units technically similar to the Atwood Southern Cross”. In a recent presentation, management indicated that ultra deepwater rigs should remain fully utilized despite newbuilds that are projected to come to market in the near future. Atwood has already contracted the newbuild Atwood Osprey with Chevron starting in the second quarter of fiscal 2011 at a dayrate between $450,000 and $475,000. The Osprey has a maximum water depth of 8,200 feet. The “to be named” semisubmersible with a 10,000 foot maximum water depth has yet to be contracted but is not scheduled for completion until the third quarter of fiscal 2012. Management believes that the Atwood Osprey should add between $1.10 to $1.20 per share in annual earnings once it is delivered and fully utilized. The “to be named” rig should generate annual earnings per share of approximately $1.00 to $1.40 once it is delivered and fully utilized in mid 2012. From time to time, Mr. Market takes leave of his senses and decides to punish the shares of all companies in an industry despite the different characteristics of individual players. The highly unlikely “worst case” scenario of all Gulf of Mexico waters closing to all forms of oil exploration (shallow and deepwater) would have an impact on many companies operating in the region including some that we have profiled in the past. However, even such a worst case scenario would have almost no impact on Atwood Oceanics. The shares are clearly cheap from a valuation perspective when looking at likely earnings for the current fiscal year or fiscal 2011. The 28 percent premium to tangible book value is somewhat higher than the valuation of Noble Corporation and Ensco but does not appear to be very aggressive. From an economic perspective, very little has changed for Atwood Oceanics since April yet the shares are on the discount rack. Investors seeking exposure to the offshore drilling sector without taking any material risk associated with the Gulf of Mexico may want to consider the company for potential investment. Hat tip to Ken Fisher’s mention of Atwood in his Forbes column appearing in the September 13 issue. Disclosure: Long Noble. No position in Atwood Oceanics or any other company mentioned in this article. Ban Naked Credit Default Swaps? Once again excellent analysis provided on this superb website. Keep up the good work Ravi. Nice article. I don’t think you stressed the leveraging that Atwood is currently undergoing with the 2 new builds in 2011 and 2012. An increased debt load with a diminishing backlog of work could put the company in a bind. Although this will not happen overnight, by the end of 2010, I believe that 4-5 of the units that Atwood has will be out of work unless new contracts are announced. Obviously, since Atwood is a little fry in this arena, they will bounce around with dayrates. The exodus of rigs out of the GOM will put more pressure on the shallow rigs that Atwood has around the globe and put additional strain and competition on units going forward. The company seems to think that demand for jack-ups is recovering in most markets and that dayrates are heading higher (Sept presentation). The company’s future, however, is tied to deepwater where they seem even more bullish. I see the main risk for Atwood, and most other contract drillers, as much more related to oil prices falling than any other factor. If we have a global double dip with oil prices back to $30 to $40, the entire industry will be in big trouble. But I have trouble envisioning such a scenario with the developing world expanding quickly and consuming a larger percentage of global oil production.